The National Association of Graphic and Product Identification Manufacturers (GPI) Industry Standards and Practices Manual identifies Metalphoto photosensitive anodized aluminum as the most durable printed aluminum substrate available, citing its applicability for extreme environmental conditions and outdoor exposure. It is an ideal choice for those designing nameplates, front panels and tags that need to last. Metalphoto performs and remains legible for decades in the harshest environments and most challenging applications. The material is durable and the graphics are high contrast with excellent resolution. Go to Durability Characteristics. 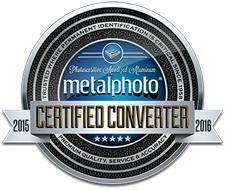 Metalphoto of Cincinnati is a certified Metalphoto converter. The images/graphics for your nameplate or panel are photographically imaged into the anodic layer of the aluminum giving you an image in black or gray-scale. Additionally, color can be screen printed into the anodic layer. .003", .005", .008", .012", .020", .032", .063", .090" and .125"
Abrasion Resistance No pronounced image loss, degradation, or reduced readability after 7000 cycles of an abrading wheel. Salt Spray Corrosion "Very good" corrosion resistance after 113 days seawater exposure. Aging No discoloration or fading after 96hour/300 psi/70°C oxygen bomb aging. Cleaning Resistance No deleterious effects when tested with alkaline cleaners (MIL-C-87937 or equivalent) for aircraft surfaces. Resistance No deleterious effect or image fade after 1 hour at -50°F. No impairment of legibility upon exposure at -67°F. Fungus Resistance Visual reading of "0" per ASTM-G21. The above tests were conducted in strict laboratory conditions. In order to achieve maximum satisfaction we highly recommend that any customer considering use of this product test the labels in the environment in which they will be used. 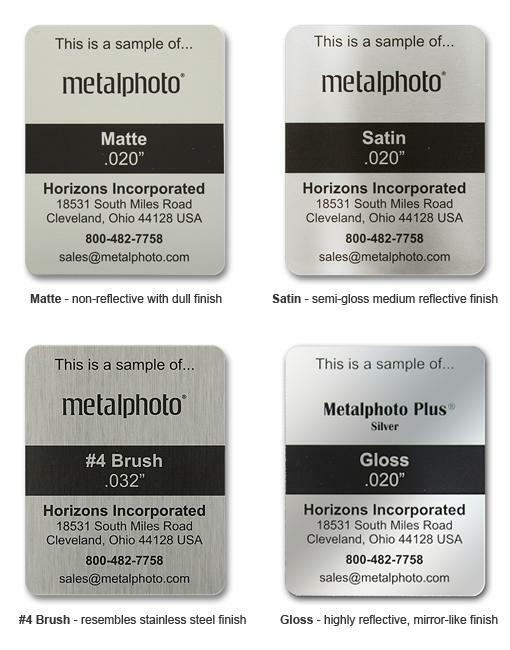 Metalphoto of Cincinnati does not warrant performance of its materials in any environment. The National Association of Graphic and Product Identification Manufacturers (GPI) Industry Standards and Practices Manual identifies Metalphoto photosensitive anodized aluminum as the most durable printed aluminum substrate available, citing its applicability for extreme environmental conditions and outdoor exposure.